The Moon is the natural partner of the Sun. While he is the natural representative of the male principle she represents the female principle. Her cyclic reflection of the Sun‘s light in her cycle from the new dark Moon to the full Moon and then back to the new dark Moon is seen as a basic reflection of life cycles and relationships. At the new Moon she is empty, all alone and dark. Then she begins absorbing the Sun‘s light which in terms of relationships represents his love. His light and love first appears as a mere sliver, then increases until the quarter Moon and on until she is filled and drunk with his love at the full Moon. 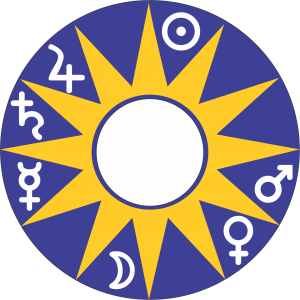 In Vedic astrology the moon is regarded as being lit and nourished by the sun. After the full Moon she then empties out until the new Moon when she is again fully dark. At this point she again yearns to be filled with his love and the process begins anew. This cyclic cycle of filling up then emptying out she is seen to be the natural representitive of relationships, everything that waxes and wanes, impermanence, desire, yearning, lonliness and fulfillment. The Moon has a special association with the female gender, mothers, women in general, babies and childbirth. She is associated with everything that is liquid, formless, soft, and tender. Because of her connection with the tides the Moon is also associated with frequent change and fickleness. In astrological interpretation the Moon in a negative state can represent idleness, laziness, and malcontent. Because of its dark spots the Moon has associations with imperfection. In the natal horoscope the Moon is the primary representitive of the emotional life. In Vedic astrology and also in palmistry the Moon is associated with images of the mind. It also shows how one likes to be nurtured and represents one’s mother. In a man’s chart it often reflects the female partner or the experience of women. In horary astrology the Moon shows the querent’s emotional state unless Cancer is on the 7th house cusp when it represents the partner or opponent. The Moon also shows the flow of events and its last and next aspects show the recent past and the immediate future. In mundane astrology and in ingress charts the Moon represents the common people and the general mood of the people. The Moon rules Cancer and is in detriment in the opposite sign of Capricorn. She is exalted in Taurus and in her fall in the opposite sign: Scorpio. In the ancient system of the Joys of the Planets, which makes a significant contribution to the underlying structure of the houses, the Moon rejoices in the 3rd house. In the 3rd house the Moon represents the Goddess. This 3rd house placement is opposite the placement of the Sun representing God or the fundamental power and intelligence of the universe, which rejoices in the 9th house. Together this natural pairing of opposites holds the keys to the wisdom of the upper and lower realms. The 3rd house and the Moon have a natural relationship as the 3rd house is associated with short journeys and all the busy comings and goings of daily life; and the Moon is the most frequent traveller of all the cosmic bodies, taking approximately 2.5 days to move through each sign. Following the Chaldean order of the houses beginning with the association of Saturn with 1st house, the Moon is associated with the 7th house. This is a natural fit as the 7th house is associated with relationships and the Moon is the natural partner of the Sun and reflects his love and light. Cold and moist, phlegmatic, nocturnal, feminine. The Moon is associated with a fleshy round face. If the Moon is waxing the face and appearance is bigger than if the Moon is waxing. If the Moon is waning the fleshiness is not so pronounced. A person strongly influenced by the Moon can be plump, corpulent and phlegmatic. The Moon is also associated with queens when she is a partner to the king. However a queen ruling in her own right, such as Queen Elizabeth II at the time of writing (October 2016), is ruled by the Sun. The Moon rules ladies and the common people, and occupations connected with women such as midwives, housekeeping and domesticity. Because of the Moon’s rapid movement through the sky it is associated with travellers and public transport. It is also associated with tramps and wayfarers. Because of its association with water and fluids it is linked to bar staff, midwives, sailors, drunkards, fishermen and fisherwomen, staff on passenger liners and sea freight; nurses, vintners, surfing and swimming, as well as those involved with tourist industries on the waterfront. In the horoscope the Moon represents people associated with the house that has Cancer on the cusp. For example if Cancer is on the cusp of the 4th house the Moon represents the father; if Cancer is on the 7th house cusp the Moon represents the partner. Anything that lives in the water such as fish, frogs, ducks, whales, sharks, otters, platypus, sea-cows, oysters, crabs, shellfish. Birds: Sea fowl, geese, ducks, water birds. Fountains, baths, highways, ports, rivers, ponds, springs. The breasts, womb, belly, stomach, right eye of women and the left eye of men.